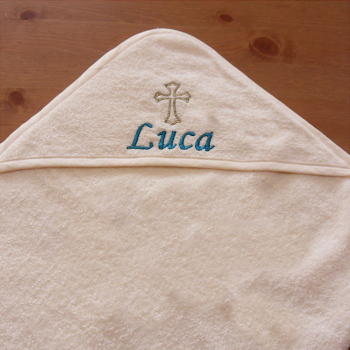 Infant Baptism or Christening keepsake towel with gold metallic thread embroidered decorative cross motif and an embroidered name of your choice personalised underneath in a thread colour of your choice. Just fill in a single name or a numerical date for us to embroider and select your preferred font style. Infant Baptism or Christening keepsake towel with gold metallic thread embroidered decorative cross motif and an embroidered name of your choice personalised underneath in a thread colour of your choice. Just fill in a single name or a numerical date for us to embroider and select your preferred font style. 75x75cm cotton baby towel with hood in cream.